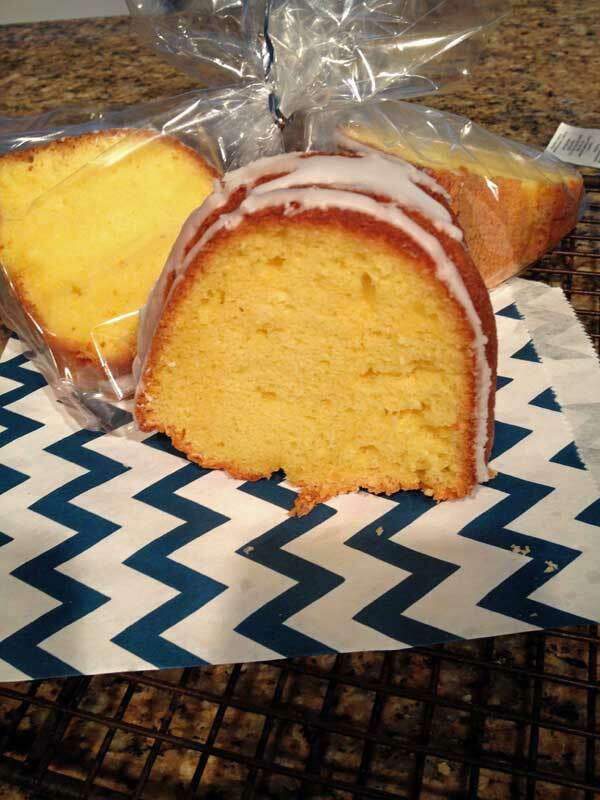 If you thought the lemon flavored 7-Up cake looked good but don’t feel like making a cake from scratch, let me introduce you to my great grandmother’s lemon pound cake recipe. This was our Louisiana “Mee-Ma’s” signature cake. Mee-Ma always made it with Duncan Hines, so I use Duncan Hines as well. Luckily, even though cake mix has been reformulated and the mixes come in smaller boxes rather than 18.25 oz boxes, the recipe still works. Duncan Hines even has it on the side of the box. The box recipe is similar, but I use my own icing which is just the standard lemon juice and confectioner’s sugar mixture. It’s an icing that sets, so you can cut the cake in pieces, wrap them individually and send them along to wherever. This cake is so versatile and travels so well. No one ever complains that it’s not scratch. Here are a couple of pictures of the variation. In this version, lemon syrup is poured over the cake while it’s cooling. 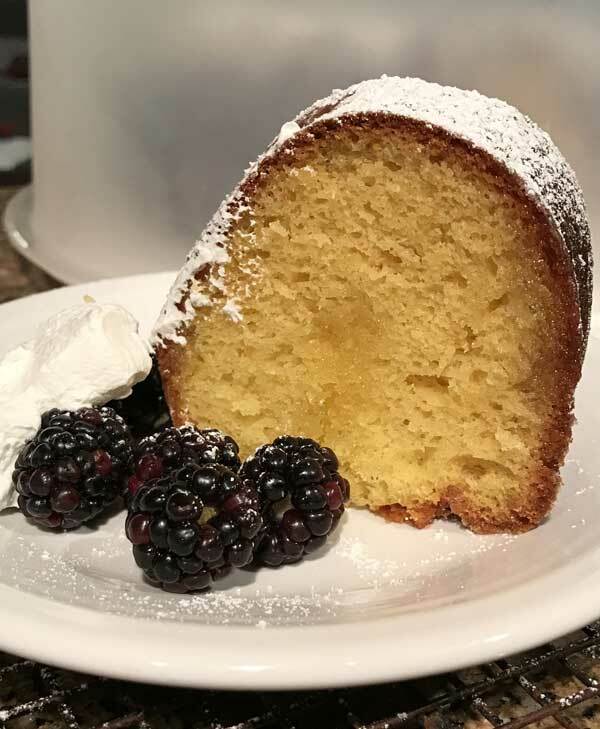 My grandmother's recipe for pound cake. Preheat oven to 350°F. Grease and flour 10-inch Bundt pan. Mix the cake mix, pudding mix, eggs, water and oil in large bowl and beat for 2 minutes with an electric mixer. Pour batter into pan and bake for 50 minutes or until a toothpick inserted in center comes out clean. Let the cake cool on a wire rack. When completely cool, carefully spoon icing over the top and let it fall down the sides. Icing: Put the powdered sugar in a large mixing bowl. Slowly, about a teaspoon at a time, add lemon juice and stir vigorously until the mixture is thick enough to drizzle. Try not to let it get too thin so it will stay opaque when set. Spoon over the cake and allow iced cake to sit until icing is firm. 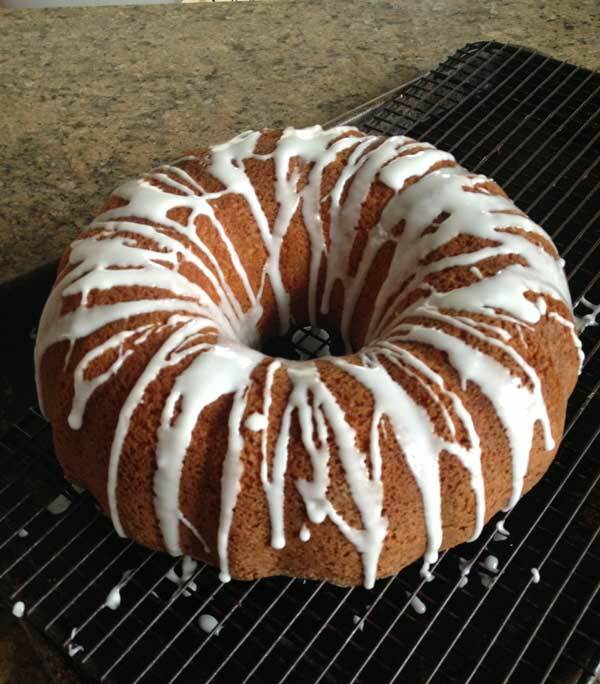 I've always made this cake with a simple drizzle of icing or a cream cheese glaze, but a reader named Angie came up with a new version. She adds the zest of a lemon to the batter and she pours a lemon glaze over the cake while it's cooling in the pan, then flips it out. The cake absorbs the lemon syrup and is a bit softer and richer. Melt the butter, sugar and water together until mixture begins to boil. Remove from heat and stir in lemon oil. Using a knife, poke deep cuts into the hot cake. Pour the lemon glaze over the hot cake while it's still in the pan. Let it cool in the pan for about 45 minutes, then invert. Anna, I only needed to bake the Triple Lemon Cake for 35 minutes, NOT the 45 minutes as written. It probably baked in less time than the original recipe states because I used a 15.25 oz. Cake Mix. The ORIGINAL recipe was from the early 1980’s and most likely used an 18 oz. size Cake Mix. PLEASE ADJUST baking time in recipe to 35-45 minutes or until toothpick inserted in center of cake comes out clean. Another note from Karen which includes a yellow cake mix enhanced with lemon flavored gelatin. Anna, I do not have a link for the Bon Appetit recipe. I clipped it out of an old magazine from 1980’s. 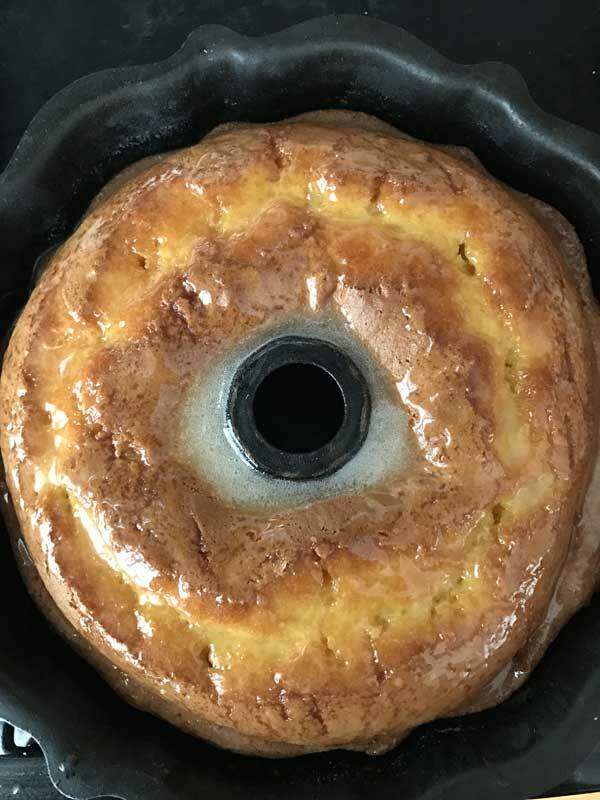 Grease & Flour 10 C Bundt Pan. Beat ALL ingredients on medium speed until smooth, about 4 min. Bake approx. 35 minutes to 45 minutes or until a toothpick inserted in center comes out clean. Cool cake in pan 25 min., invert onto wire rack & cool completely. Stir ALL ingredients together until sugar dissolves. Spoon Glaze over cooled cake, allowing to drip down sides. Note: This comment is from Karen B. I am moving it from another thread and putting it with this cake since the changes apply to this cake. Anna, I made the Lemon Cake with The Duncan Hines Cake Mix and Lemon Pudding. 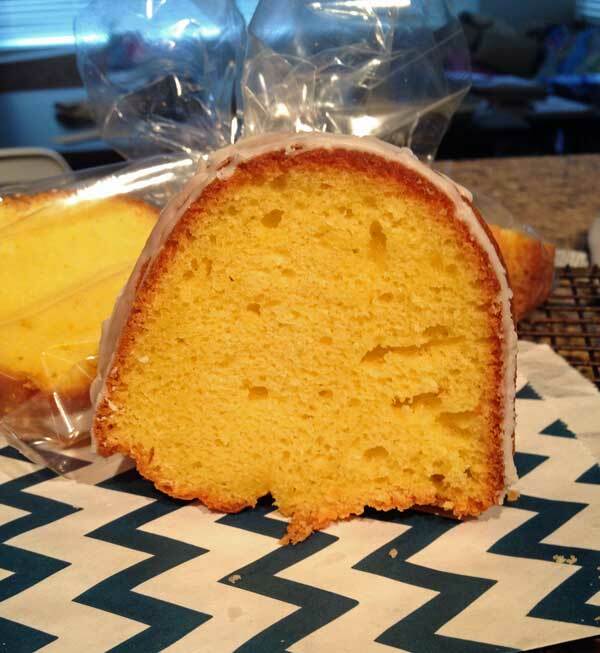 I thought the cake was good but for my family, it needed a bigger “burst” of Lemon flavor. I made it a second time with these additions and it was THE BEST LEMON CAKE ever!!! 1. I added zest of 1 lemon to the batter. 2. Instead of icing the cake, I dumped a hot lemon sugar syrup over it when it came out of the oven. This slightly hardened giving the cake a crispy lemon coating. This extra crunchiness truly enriched this cake. Combine all Glaze Ingredients in a small saucepan, cook over medium heat until butter is melted and SUGAR is dissolved. Do NOT Boil. Insert a knife deeply into cake and “poke” holes. Pour glaze over entire cake. Use a rubber spatula to gently pull cake away from sides of pan for glaze to sweep down. Allow cake to cool completely in pan, approx. 45 minutes., than invert onto a serving plate. Dust with sifted confectioners’ sugar if desired. If you try this, please let me know what you think. I guarantee you will not be disappointed! Awwww….good memories and a delicious cake – doesn’t get any better than that! This was my husband’s grandma’s specialty. I now make it and bring it to every holiday. I also use the recipe on the box and I’m going to try your icing next time. By the way, I’ve used other cake mixes and the cake doesn’t really “turn out” unless you use the Duncan Hines mix. Maybe because Duncan Hines is the only one without pudding in the mix? There is nothing quite like Mee-ma recipes! The cake I always remember form my grandma is angel food cake. I would not doubt if she used a cake mix for that one.